Simple to use, and offers unmatched signal thanks to the three triversity receivers built in. 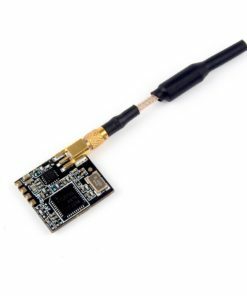 If you want a great signal but dont want the hassle of compliated RX menus then then FX Tripple Play Receiver module is what you need. You can get excellent signal thanks to the 3x receivers allowing you to use 2x high gain patch and 1x omni antenna. Alternatively you could use 3x high gain patch antennas with a wider beam angle (like the X-air) to get full 360 degree coverage. There is a case to be had that you can overcome any fancy software features (like those offered on the True-D and Rapidfire module) by just having excellent antennas. Although this unit does not have all the fancy features offered by the True-D/Rapidfire modules, it is around the same price, but has 3x individual receivers built in to give you lots of flexibility to mounting your antennas. Furthermore thanks to the integrated 1/4 inch tripod mount, you can mount this RX on a tripod to improve signal even more.